I love a nice, hot shower with nice smelling soap and shampoo with the hot water running my feelings of being unclean down the drain. There’s no better feeling than a nice hot shower. Well, one of life’s guilty pleasures really! 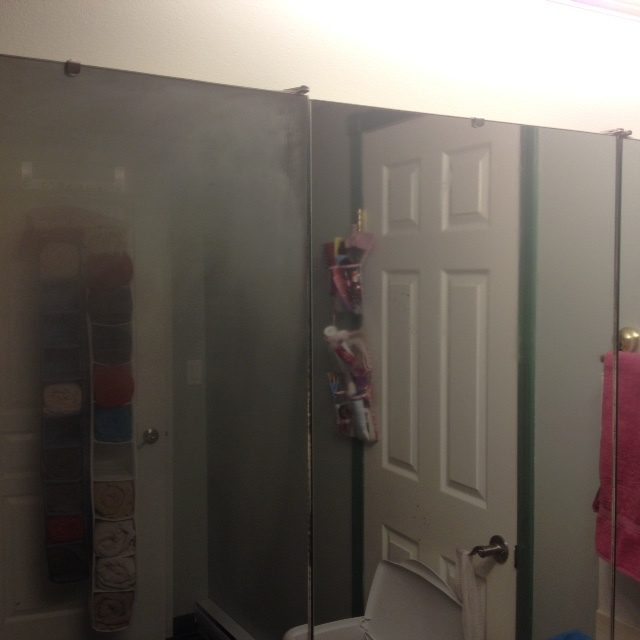 I just don’t like getting out to see an extremely fogged up mirror that seems to take forever to defog. So while having a problem that was a pet peeve I thought I would look for a solution on Pinterest! My favourite way to delete a problem….Pinterest must have a solution! 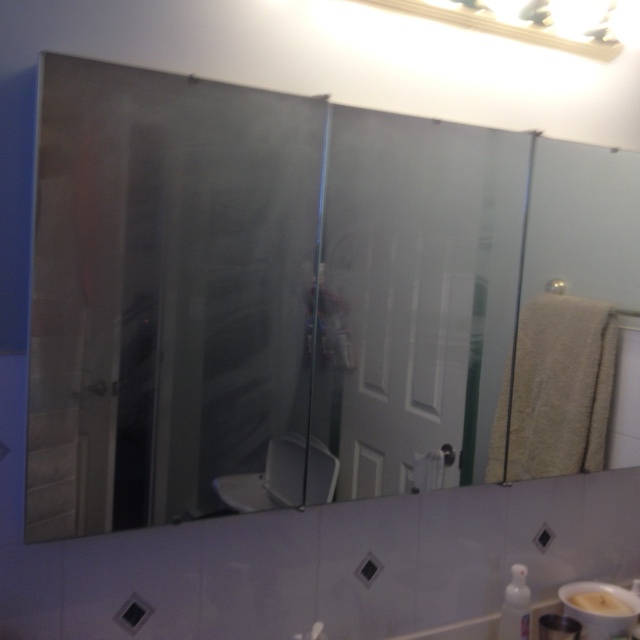 During my research I found several different ways to defog a bathroom mirror. Some suggest shaving cream….couldn’t figure out how but pinned it nevertheless. Some suggested a product I didn’t have nor couldn’t figure out where in the world I would buy it. But one pin intrigued me….it mentioned soap. I have soap, lots of different soap so I kept reading. The pin that not only caught my eye but also made me want to go try it…including taking another shower…was by Courtenay at The Creek Line House with her link below. Here is a collage of photos of the before and after the soap trick. I hope the pictures are clear enough to show you the most incredible transformation to my bathroom that I’d ever seen. We are currently renting so I didn’t want to ruin the mirror but wanted to have a clear view of myself getting ready in the morning. I know some people might think “why don’t you just turn on the bathroom exhaust fan?” Well I do, but it’s a recirculating one that doesn’t get rid of the steam as quickly as my old house exhaust fan did and well…. I’m used to a certain routine in the morning and somethings are good to change….my routine is not! This really did work so here’s what I did. Because I have 3 mirrors in my bathroom I thought I would just do 1 to see if it really would work so on the right mirror I tried to used a bar of new soap and gently rubbed it on the mirror to see the soap coat the mirror. Based on the information from Courtenay, I lightly rubbed the soap on so I would be able to save my arm during the next step. 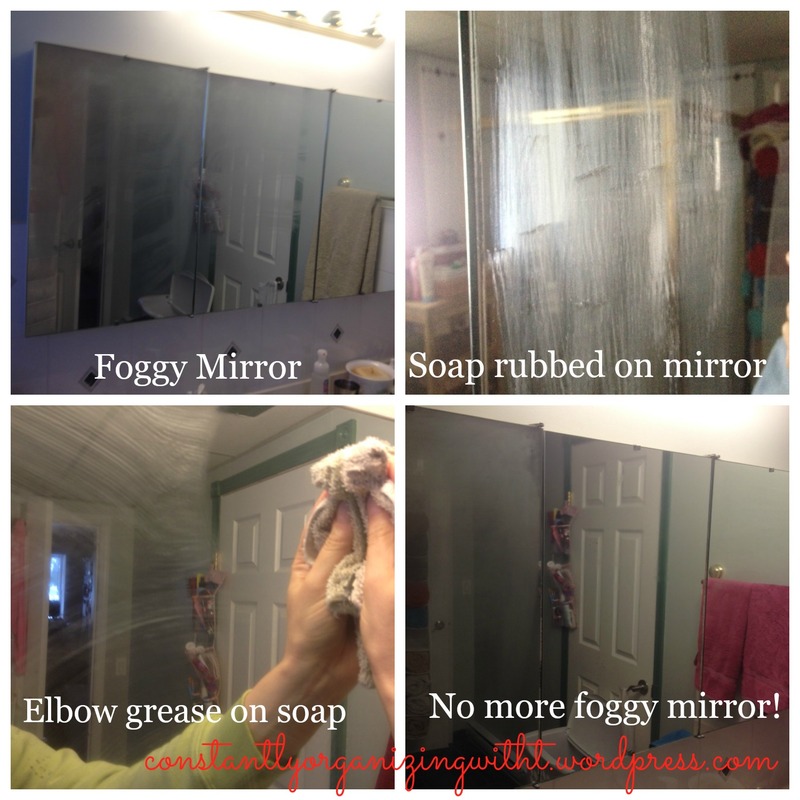 Ensure you cover the mirror because what doesn’t get coated gets foggy. You don’t want a big streak of fog in an otherwise clear mirror! Then I used a dry cotton rag to rub the soap off the mirror. It did require some elbow grease but it managed to come off fairly quickly because I hadn’t applied a ton of soap to the mirror. Small circles seemed to do the trick and working in small sections seemed to save my arm! Enjoy your fog free mirror! That’s it! Super easy and quick and really does work. I’ve been waiting a couple of weeks since doing this before posting on it to see if it actually would last. I can report that after about 3 weeks I still have a fog free right mirror!! I guess I can do the other 2 so they are all fog free!! Thanks for the awesome tip Courtenay from The Creek Line House, I’m so glad I tried it!! Hope you get to try this, it really is a true fog free mirror!! Thanks for stopping by Constantly Organizing With T!! < Previous Plastic Bag to Organized Container – Making Food Easier to Find!